Marco Frascari believed that architects should design thoughtful buildings capable of inspiring their inhabitants to have pleasurable and happy lives. 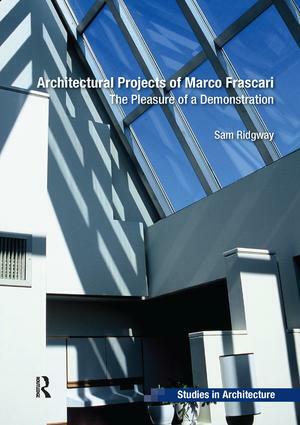 A visionary Italian architect, academic and theorist, Frascari is best-known for his extraordinary texts, which explore the intellectual, theoretical and practical substance of the architectural discipline. As a student in Venice during the late 1960s, Frascari was taught and mentored by Carlo Scarpa. Later he moved to North America with his family, where he became a fulltime academic. Throughout his academic career, he continued to work on numerous architectural projects, including exhibitions, competition entries, and designs for approximately 35 buildings, a small number of which were built. As a means of (re)constructing the theatre of imaginative theory within which these buildings were created, Sam Ridgway draws on a wide selection of Frascari’s texts, including his richly poetic book Monsters of Architecture, to explore the themes of representation, demonstration, and anthropomorphism. Three of Frascari’s delightful buildings are then brought to light and interpreted, revealing a sophisticated and interwoven relationship between texts and buildings. Sam Ridgway is an architect and senior lecturer in the School of Architecture and Built Environment at the University of Adelaide, South Australia. He received his PhD from the University of Sydney. His research explores the history, theory and practice of architectural construction, and he teaches construction and design from within this intellectual and practical context.